ICL HealthCare Choices, Inc. (HCC) is committed to preserving the privacy and confidentiality of your health information whether it is created by us or maintained on our premises. We are required by certain state and federal regulations to implement policies and procedures to safeguard the privacy of your health information. Copies of our privacy policies and procedures are maintained in the facility’s administrative office. We are required by state and federal regulations to abide by the privacy practices described in this notice including any future revisions that we may make to the notice as may become necessary or as authorized by law. Individually identifiable information about your past, present, or future health or condition, the provisions of health care to you, or payment for the health care treatment or services you receive is considered protected health information (PHI). We are required to provide you with this Privacy Notice that contains information regarding our privacy practices. This Notice explains how, when and why we may use or disclose your protected health information and your rights and our obligations regarding any such uses or disclosures. Except in specified circumstances, we must use or disclose only the minimum necessary information to accomplish the intended purpose of the use or disclosure of such information. We reserve the right to change this notice at any time and to make the revised or changed notice effective for health information we already have about you as well as any information we receive in the future about you. Should we revise/change this Privacy Notice, we will post a copy of the new/revised Privacy Notice in the facility’s waiting area and on HCC’s website. You also may request and obtain a copy of any new/revised Privacy Notice from the reception desk. Should you have questions concerning our Privacy Notice, the name, location, telephone number, website address, etc., of whom you should contact are listed on the last page of this document. We use and disclose your protected health information for a variety of reasons that do not require authorization to release it. We have a limited right to use and/or disclose your health information for purposes of treatment payment or for the operations of our program. For other uses, you must give us your written authorization to release your protected health information unless the law permits or requires us to make the use or disclosure without your authorization. We may disclose your protected health information to those who are involved in providing medical treatment, physical therapy, mental health treatment, dental care or other treatment services to you. For example, we may release health information about you to physicians, dentists, nurse practitioners, psychologists, therapists, and pharmacists. We may disclose your protected health information to outside entities or individuals performing other services relating to your treatment, such as diagnostic laboratories, home health/hospice agencies, family members, etc. Protected health information may be sent to treatment providers and agencies to which you are referred. Protected health information may be provided to a company that transports you to and from your treatment appointments and bills Medicaid for this service. All disclosures provide the minimum necessary information. We may use or disclose your protected health information to bill and collect payment for services or treatments we provided to you. For example, we may contact your insurance company, health plan (e.g. Medicaid, Medicare, Fidelis), or another third party to obtain payment for services we provided to you. 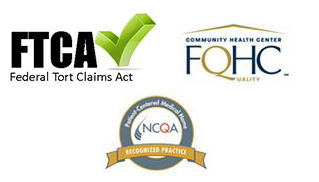 We will disclose protected health information to the government agencies that award entitlements (e.g. Supplemental Security Income, Medicaid) if we are providing you with assistance in getting these entitlements. We may also provide such information to a business associate to facilitate billing and collection of payments for services. We may use or disclose your protected health information to perform certain functions within our Health Center should these uses or disclosures become necessary to operate the Center and to ensure that you and others we provide care and services to continue to receive quality care and services. For example, we may use a photograph of you for emergency identification purposes or use your health information to evaluate the effectiveness of the care and services you are receiving. We may disclose your protected health information to our staff (e.g. physicians, dentists, nurse practitioners, psychologists, therapists, quality assurance personnel, students in an authorized training program, staff consultants, etc.) for auditing, care planning and coordination, treatment, quality improvement and learning purposes. We may also combine your health information with information from other health care providers to study how our Center is performing in comparison to like programs or what we can do to improve the care and services we provide to you. When information is combined, we remove all information that would identify you so that others may use the information in developing research on the delivery of health care services without learning your identity. Treatment Alternatives, and Health-Related Benefits and Services: We may use or disclose your protected health information when we contact you to remind you of an appointment or when we contact you to inform you of treatment alternatives or health-related benefits and services that may be of interest to you. For example, you may be reminded of an appointment with a psychiatrist or told to contact HCC about a laboratory test result or procedure that has a direct relationship to your treatment or medical condition. We may disclose your protected health information when an international, federal, state, or local law requires that we report information about suspected abuse, neglect, or domestic violence, reporting adverse reactions to medications or injury from a health care product. in emergency circumstances to report: a crime; the location of the crime or victims; or the identity, description or location of the person who committed the crime. We may disclose your protected health information when we are required to collect information about diseases or injuries (e.g., your exposure to a disease or your risk for spreading or contracting a communicable disease) or condition, product recalls, or to report vital statistics (e.g., births/deaths) to the public health authority). We may disclose your protected health information to a health oversight agency such as a protection and advocacy agency, the state Department of Health which is responsible for inspecting our Center or to other agencies responsible for monitoring the health care system for such purposes as reporting or investigation of unusual incidents or to ensure that we are in compliance with applicable state and federal laws and regulations and civil rights issues. We may disclose Health Information to our business associates that perform functions on our behalf or provide us with services if the information is necessary for such functions or services. For example, we use another company to perform billing services on our behalf. All of our business associates are obligated to protect the privacy of your information and are not allowed to use or disclose any information other than as specified in our contract. We may disclose your protected health information to a coroner or medical examiner for the purpose of identifying a deceased individual or to determine the cause of death. We may also disclose your health information to a funeral director for the purposes of carrying out your wishes and/or for the funeral director to perform his/her necessary duties. If you are an organ donor, we may disclose your protected health information to the organization that will handle your organ, eye or tissue donation for the purposes of facilitating your organ or tissue donation or transplantation. We may disclose your protected health information to avoid a serious threat to your health or safety or to the health or safety of others. When such disclosure is necessary, information will only be released to those law enforcement agencies or individuals who have the ability or authority to prevent or lessen the threat of harm. We may disclose protected health information of military personnel and veterans, when requested by military command authorities, to authorized federal authorities for the purposes of intelligence, counterintelligence, and other national security activities (such as protection of the President). P. Inmates or Individuals in Custody. Other uses and disclosures of protected health information not covered by this Notice or the laws that apply to us will be made only with your written authorization. If you do give us a written authorization, you may revoke or cancel it at any time by submitting a written cancellation to the individual listed at the end of this document and we will no longer disclose protected health information under the authorization. But disclosure that we made in reliance on your authorization before you revoked it will not be affected by the canceling. A. To Request Restrictions on Uses and Disclosures of Your Protected Health Information: You have the right to request that we limit how we use or disclose your protected health information for treatment, payment, or health care operations. You also have the right to request a limit on the health information we disclose about you to someone who is involved in your care or the payment for your care or services. For example, you could request that we not disclose to family members or friend’s information about a medical treatment you received. We are not required to agree to your restriction request. However, should we agree, we will comply with your request not to release such information unless the information is needed to provide emergency care or treatment to you. If the restricted health information is needed to provide you with emergency treatment, the Center may use the restricted protected health information, or may disclose such information to a health care provider, to provide such treatment. Should you wish a restriction placed on the use and disclosure of your protected health information, you must submit such request in writing. The name, location and telephone number of the person to whom the request is to be submitted is listed at the end of this document. You have the right to inspect and copy your health information, such as your medical and billing records that we use to make decisions about your care and services. In order to inspect and/or copy your health information, you must submit a written request to us. If you request a copy of your medical information, we may charge you a reasonable fee for the paper, labor, mailing, and/or retrieval costs involved in filing your requests. We will provide you with information concerning the cost of copying your health information prior to performing such service. The name, address, and telephone number of the person to whom you may file your request is listed at the end of this document. We will respond within ten (10) days of receipt of such requests. Should we deny your request to inspect and/or copy your health information, we will provide you with written notice of our reasons of the denial and your rights for requesting a review of our denial. If such review is granted or is required by law, we will select a licensed health care professional not involved in the original denial process to review your request and our reasons for denial. We will abide by the reviewer’s decision concerning your inspection/copy requests. You have the right to request that your health information be amended or corrected if you have reason to believe that certain information is incomplete or incorrect. You have the right to make such requests of us for as long as we maintain/retain your health information. Your requests must be submitted to us in writing. We will respond within sixty (60) days of receiving the written request. If we approve your request, we will make such amendments/corrections and notify those with a need to know of such amendments/corrections. The information is already accurate and complete. If your request is denied, we will provide you with a written notification of the reason(s) of such denial and your rights to have the request, the denial, and any written response you may have relative to the information and denial process appended to your health information. The name, location and telephone number of the person to whom you may file your request is listed at the end of this document. You have the right to request that we communicate with you about your health matters in a certain way or at a certain location. For example, you may request that we send you information electronically or that we not send any health information about you to a family member’s address. We will agree to your request as long as it is reasonably easy for us to do so. You are not required to reveal nor will we ask the reason for your request. Identify to whom the restrictions apply (e.g., which family member(s), agency, etc.). The name, location, and telephone number of the person to whom you may file your request is listed at the end of this document. You have the right to request that we provide you with a listing of when, to whom, for what purpose, and what content of your protected health information we have released over a specified period of time. This accounting will not include any information we have made for the purposes of treatment, payment, or health care operations or information released to you, your family, or disclosures made for national security purposes, or any releases pursuant to your authorization. Your request must be submitted to us in writing and must indicate the time period for which you wish the information (e.g., May 1, 2015 through August 31, 2015). Your request may not include releases for more than six (6) years prior to the date of your request and may not include releases prior to April 14, 2010. Your request must indicate in what form (e.g., printed copy or email) you wish to receive this information. We will respond to your request with sixty (60) days of the receipt of your written request. Should additional time be needed to reply, you will be notified of such extension. However, in no case will such extension exceed thirty (30) days. The first accounting you request during a twelve (12) month period will be free. There may be a reasonable fee for additional requests during the twelve (12) month period. We will notify you of the cost involved and you may choose to withdraw or modify your request at that time before any costs are incurred. The name, location, and telephone number of the person to whom you may file your request is listed at the end of this document. F. Right to an Electronic Copy of Electronic Medical Records. Your protected health information is maintained in an electronic format (known as an electronic medical record or an electronic health record), and you have the right to request that an electronic copy of your record be given to you or transmitted to another individual or entity. We will make every effort to provide access to your protected health information in the form or format you request, if it is readily producible in such form or format. If the protected health information is not readily producible in the form or format you request your record will be provided in either our standard electronic format or if you do not want this form or format, a readable hard copy form. We may charge you a reasonable, costbased fee for the labor associated with transmitting the electronic medical record. G. Right to Get Notice of a Breach. You have the right to be notified upon a breach of any of your unsecured protected health information. H. The Right to Receive a Paper Copy of This Notice: You have the right to receive a paper copy of this notice even if you have agreed to receive an electronic copy of this notice. You may request a paper copy of this notice at any time or you may obtain a copy of this information from HCC’s website. A. Individuals Involved in Your Care or Payment for Your Care. We may disclose your protected health information to disaster relief organizations that seek your protected health information to coordinate your care, or notify family and friends of your location or condition in a disaster. We reserve the right to change this notice and make the new notice apply to health information we already have as well as any information we receive in the future. We will post a copy of the new/revised Privacy Notice in the facility’s waiting area and on the website. The notice will contain the effective date located at the bottom of the page. If you have reason to believe that we have violated your privacy rights, violated our privacy policies and procedures, or you disagree with a decision we made concerning access to your protected health information, etc., you have the right to file a complaint with us or the Secretary of the Department of Health and Human Services. Complaints may be filed without fear of retaliation in any form. The name, location, and telephone number of the person to whom you may file your complaint is listed below. You may contact the individual listed below to address any issues related to the privacy of your protected health information.